1. Try using a scanner or a digital camera to copy the pictures from manga books so you won´t have to cut your manga books. 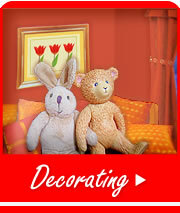 Using computer you can enlarge or crop the pictures to fit percectly to your design. Print pictures on white paper and cut out. If you want to make it quick it´s a lot quicker to jut the pictures from manga books with scissors, thoug. 2. 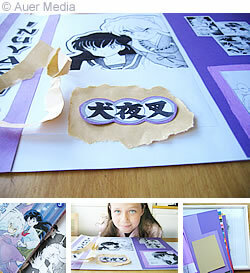 Make a nice layout of your manga pictures and glue all pieces on the background paper. 3. The japanese marks in the picture are first printed on white paper and cut out. They are glued on violet paper and again cut out. Finally they are glued on a torn out piece of brown envelope. 3. If you like apply a few drops of glitterglue to embellish your picture. 4. Put all the pieces together and hang your fabulous manga picture collection on the wall.